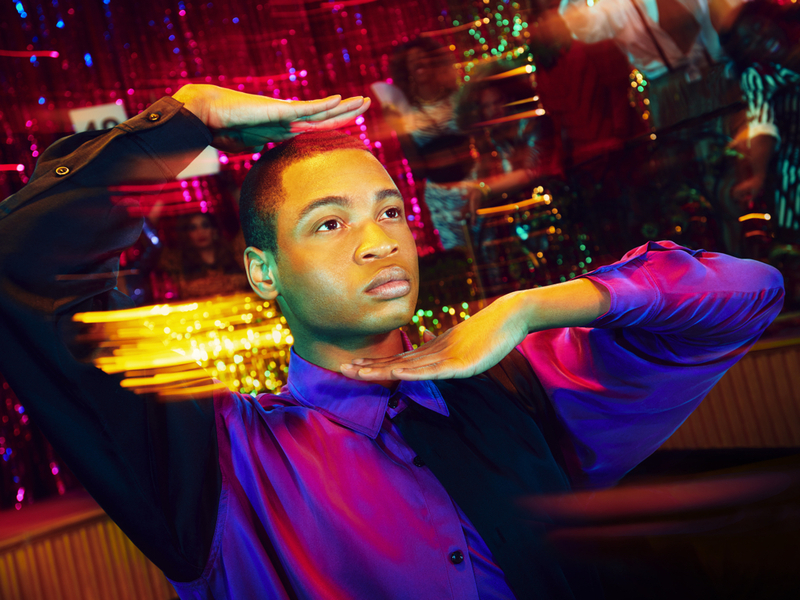 Ryan Jamaal Swain, who stars in Ryan Murphy’s FX series Pose, believes America needs the groundbreaking drama about New York’s ball culture of the 1980s. The acting newcomer—he’d graduated from Howard University the year before and moved to New York when “Pose“ came along—knew about ballroom from the award-winning 1990 documentary “Paris Is Burning.“ Working on “Pose,“ with its large cast of transgender actresses, gave him a deeper understanding of its significance to the transgender community. Swain plays Damon Richards, an aspiring dancer who travels to New York City after being kicked out of his conservative home in Allentown, Pa. Homeless and dancing in the park for change, Damon is saved by Blanca Rodriguez (MJ Rodriguez), a ballroom regular forming her own House of Evangelista. As house mother, Blanca exposes Damon to the “world of gossamer and lace that is the ballroom scene,” as Swain told me during the January TV Critics Association winter tour in Pasadena, Calif. She also fights for him beyond the balls, reinforcing the show’s theme that we often need our chosen families more than our birth families. Swain talked about the similarities between Damon’s story and his personal history as well as the show’s importance at a difficult time when people struggle to recognize their similarities over their differences. “Pose“ airs at 9/8c Sundays on FX, or watch on the FX site. You—well, Damon—is the viewers’ entry into the ballroom world? Yes, exactly. … It’s about really finding your place and cultivating your own family whilst going for what you want. I think that is how the audience can follow him into the world of ballroom, which many people aren’t privy to. The show will use Damon as the springboard to ask all these exciting questions … about the family that we cultivate versus the family that we were placed in: How do we nurture those spaces where we get love and an abundance of support? And when you don’t have one or the other, how do you find that? That’s going to be beautiful exploration for anybody who went to college, for anybody who has said, “No, I’m not going to be a dentist; I’m gonna be an artist.” I hope they really grasp that this experience [onscreen] is a universal experience, that we are all seeking love and support and family. That’s a lot of responsibility for a young actor like yourself. But I can tell you are excited for it. Yes. It’s great being able to tap into that experience as an enthusiast of that world and of “Paris Is Burning.” As a small boy from Birmingham, Ala., I didn’t really understand it. But now I get to live in New York and be part of a show called “Pose,” and really understand ballroom. Just as Damon is learning about it, I’m understanding it. It’s becoming as vividly and infinitely clear to me as it is to him. There’s a lot of heart and a lot of authenticity in the series that I think will be refreshing to the people who are not privy to “Paris Is Burning” or to ballroom culture. You don’t feel like you have to catch up on the scene because you’re learning as we’re learning and you’re learning as Damon is learning. Do you feel you’re getting an education from your cast mates as well? It is such a beautiful cast of human beings that I’m learning so much about—and learning from. I’m learning identity, how important being who you are and the statement, “I am,” is. These women—my cast mates, my co-stars—are just really strong. They’re cultivating strength in myself as well. I feel like there will be a lot of surprises in this season for viewers, and I cannot wait. I think “Pose” will bring a lot of revelations and hopefully some understanding to the mainstream. Just having Janet Mock and Our Lady J as writers gives the piece integrity. You realize that no matter how different we are, we are all similar when going after our dreams and dealing with conflict in a hard and sometimes unbearable way. As queer black man myself, I feel like being able to find the spaces in which we are synergistically connected in regards to “I see you, I hear you” is important. Our experiences might not be the same. However, the way in which we have had to negotiate our space for so long is now changing. It is no longer taboo for us to exist; that’s now becoming something that is a part of the zeitgeist. And having time to zhuzh that vision, and to go to a performing arts high school, and then go to Howard University in Washington, D.C., and then move to New York City in 2016, when I graduated, and then having this moment of true, true, true, true, true storytelling in an experience that I’ve never seen, it’s been amazing. It’s been transformative for me in regards to becoming a part of such a brilliantly dynamic and colorful world that is a part of my culture as a person of color who is gay. It really is a moment in which I can appreciate and celebrate the Freddie Pendavises and the Willi Ninjas, and the House of Oct St. Laurent and all of these spaces that have formed houses for displaced youth in a time in which we were being displaced. But my story is Alabama, D.C., New York—hitting the ground running, doing waitering and any type of temp job I could to continue dancing and acting. How did you feel about this role when you first read it? There was just such a level of centeredness and groundedness in who Damon was that lived in me, that mirrored my own reality and my own presence. It just felt like I was literally putting on a glove that was made for me. There seems to be similarities in at least your recent history with Damon. Does it make you think it was meant to be? Just being able to work with Ryan Heffington, the choreographer for a bit of my choreography for the show, is amazing. Also with Danielle Polanco and Leiomy Maldonado, who have been a part of the voguing scene and the ballroom culture. To be introduced and to be immersed and saturated in their process and in this work has been a dream come true. It has been a revelation for myself and I hope Damon as well, because he’s beginning to see just where he lies in the universe, and his purpose, and the same is happening with me. I hope that the general populous grasps that the story is key in “Pose.” The story is about displaced people finding, nurturing and cultivating family and love in a world that would not have done otherwise. That the story is about love and acceptance, unity, and finding your village, your tribe. I think that theme will speak true to any underdog, to any person with a dream, to anyone who wanted to go for the carrot, and was going for it, but didn’t quite reach it until the very moment where they’re about to give up. “Pose” is a Cinderella tale for the underdog, the hard worker, and the one that will be looked over because they’re not this or that.